Powers/Abilities: Dansker possesses superhuman strength and durability to an unknown extent. He is skilled in combat, especially with a quarterstaff. He can possess humans and channel some of his power through them. He has resistance to conventional injury, aging, disease, etc. 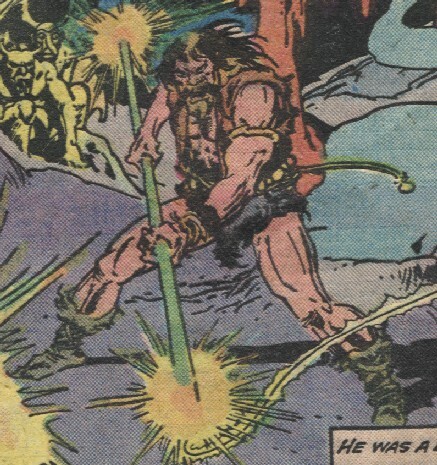 (Marvel Premiere#27 (fb) - BTS) - Dansker's origins are unknown, but in the bowels of Hell he is a legend. He was reputed to be "older than time," and he is renown for taking the patterns of men's lives and tangling them, warping them, and/or shattering them and laughing at the result. Dansker claims to have once ruled a host of demons comparable to that ruled by Satana's father. Satan managed to defeat him via treachery, using darkling spells to bind Dansker to his service and make him Satan's slave. He served him for countless eons as his lap dog, biding his time while building up his strength, waiting for Satan's spells to weaken so that he might escape his control. (Marvel Premiere#27 (fb) - BTS) - Satana's began her tutelage under the ancient demon Dansker. (Marvel Premiere#27 (fb)) - As part of a graduation day type of test, Satana was pitted against Dankser in a struggle that had the potential for death. Satana got in a few good strikes, surprising her master, but Dansker then focused more fully and easily humbled her. He did not strike the killing blow, but made it clear that he could have, and that he would always be her master. 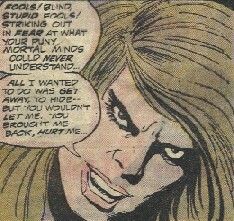 (Marvel Premiere#27) - Under unknown circumstances, Dansker managed to contact the witch Deborah Hirsch, who resisted him with all of her might. However, when a group of townspeople ambushed Deborah and prepared to burn her at the stake, her concentration lapsed and Dansker took hold, draining her soul and possessing her mortal form. In Deborah's form, Dansker slaughtered the crowd that had attempted to burn her, also stunning Satana, who had been drawn to the crowd by the energies of Dansker. Dansker then traveled to the Cairn-on-the-Cliff, where he planned to sacrifice young Adam Rossi, presumably for a spell that would allow him to access his full power and/or free his physical form from Hell. Recovering, Satana confronted Dansker and managed to overpower his mortal form and rescue Adam. Dansker then tried to run Satana down with a car, but Satana summoned forth the Basilisk, which slew Dansker, leaving Deborah's form dead as well. Comments: Created by Chris Claremont and the Tribe. Not the best story in the world, but here it is anyway! In the self-same issue (i.e. Marvel Premiere#27) Satana refers to Dansker as an "Old One", which Claremont has Dr. Strange refer the N'Garai to in his basement in Dr. Strange II#45 (whereas everywhere else he refers to them as the "Elder Gods"). In addition, in order to access his full power and/or access/free his physical form from Hell he had to perform a sacrifice on a Cairn, geographical sites which only the N'Garai are known to access our realm via. This would all seem to suggest he is an N'Garai, but what sort � a demon or a master?